Dar es Salaam — Home Affairs minister Kangi Lugola is a man under siege as a restless public piles pressure on the police to provide answers on the whereabouts of abducted billionaire-businessman Mohammed Dewji. Today will be the fourth day since the popular businessman and former Singida Urban Member of Parliament was brazenly abducted by gunmen who took him to an unknown place. 'Mo' as he is commonly called was abducted as he strode into the Colosseum Hotel fitness club in upmarket Oyster Bay suburb. The identity of his abductors and their motive remains a matter of conjecture. Mo's family is anxious for any news on his safety as is the general public who have taken to social media to demand action from the police as the first critical 48 hours of cracking an abduction lapsed without a useful clue. Mr Lugola came out for the first time yesterday to defend the police over what is seen as failure to tame the wave of abductions that have lately engulfed the nation. A cross section of leaders and human rights activists have accused the police of exhibiting a sense of helplessness in identifying and blowing the whistle on the identity of the abductors who have simply been fashioned "unknown." Addressing a press conference in his office in Dar es Salaam after a closed door meeting with the top police command, Mr Lugola assured that efforts were underway to search for the missing businessman. 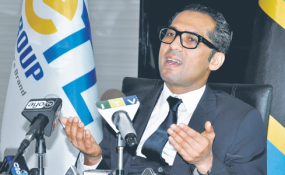 "Authorities are doing their work so let us all remain calm," said Mr Lugola, adding that the public should also understand that the police were not only investigating the disappearance of Mr Dewji but also of many other Tanzanians who are reported missing." He blamed the media coverage of the incident involving Mr Dewji, arguing it created the impression that the police were unable and that they were acting only on this particular case. The minister will however be hard placed not to isolate the Mo abduction which attracted worldwide attention due to his profile as one of Africa's youngest dollar-billionaire and rising business magnate with a presence in over 20 countries. According to Mr Lugola, some 20 people are being held in connection to Dewji's abduction. The full identities of those in custody was not provided but sources say they include six guards and four employees of the Colosseum Hotel. Reports also suggest a number of businessmen have been picked for questioning. Mr Lugola revealed a total of 56 Tanzanians have been kidnaped in the last three years over political, economic, witchcraft, revenge and crime of passion. To prove that the police are doing their job, the minister said of the nine people abducted in 2016, five were rescued. In 2017, 27 people were abducted and 22 of them were also rescued. The police also arrested the perpetrators of some of the incidents. He also revealed that a total of 21 people were abducted between January and October this year but 17 of them were rescued and 10 culprits have been arraigned. The minister said of the 18 children who were kidnapped in the last two year, 15 were found and reunited with their families. "Let me use this opportunity to assure Tanzanians that our country is safe and they should continue with their daily activities without fear," said Mr Lugola. He said the government will install CCTV cameras in various parts of the country in a bid to address the incidents of kidnap and abductions. He brought up the issue of CCTV cameras even as it was a subject of the critique of how the police failed to use those installed at the Colosseum Hotel to unravel Mr Dewji's abduction. The police have issued contradictory statements over the CCTV at the scene of crime, with Dar es Salaam special police zone commander Lazaro Mambosasa at least giving two different versions of whether there was any recording of Mo's abduction and the identity of the 'white' men who were involved.